A pretty and very useful 'weed'. The flowers (capitula, flower head or pseudanthium) last only one day, the rays are first blue and then, while following the path of the sun, they turn pink, white and finally brown and withered. Fortunately, the flower heads (clusters of flowers without stalks looking like a single flower) do not bloom all at once. We find two to three flowers in the axils of each leaf, one of those flowers is sessile (directly on the stem) and the others have a stalk. 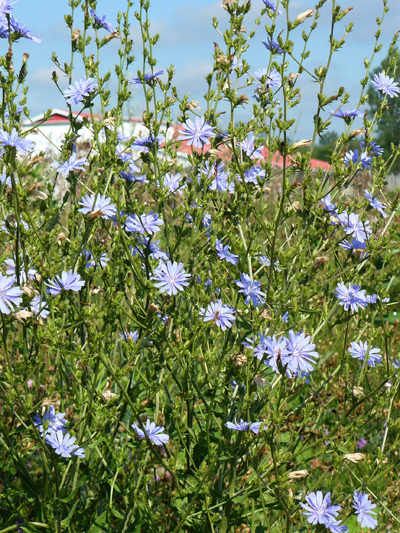 The Wild chicory is an introduced from Eurasia. Taproot (relatively straight and tapered root from which other roots grow laterally).